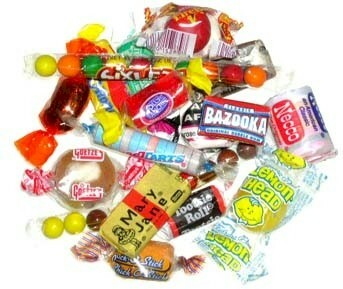 For 2 cents I could buy a "boodle bag" which was a small brown bag filled with the rejects of the local candy company. Dentists loved them. This photo looks like the majority of my Halloween bag. Every now and then a great person would slip in 3 musketeer or snickers. Those people should be in heaven now for making a bunch of 6 year olds so happy. Remember the blue sparkly gum ball called Sputnik?